Original Editor - Ariel Schillaci. 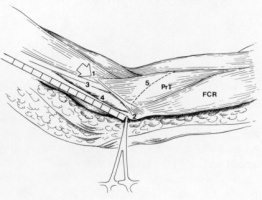 A Ligament of Struthers has been identified and studied in a cadaveric arm. Its relationships to a rudimentary supracondylar process, the pronator teres muscle, the median nerve, and the medial epicondyle of the humerus are described. Compared to an extensively studied series of normals, the ligament in this case was associated with abnormally proximal branching of the median nerve, a finding which is surgically significant and not addressed in the literature to date. It was highlighted by John Struthers, who discussed the feature's evolutionary significance with Charles Darwin. Its incidence was estimated by Struthers at 1%, but more recently has been estimated at 13.5%. Its clinical significance arises from the fact that the median nerve and brachial artery may pass through the "arch" formed by the process and ligament over the humeral body. The ligament of Struthers most often arises from a supracondylar process, a bony projection at the anteromedial aspect of the distal humerus approximately 5 cm proximal to the medial epicondyle and extends to the medial epicondyle of the humerus. Supracondylar process syndrome: The median nerve is susceptible to entrapment at the distal humerus in the presence of a fibrosseous tunnel formed by the humerus and the ligament of Struthers. 1. 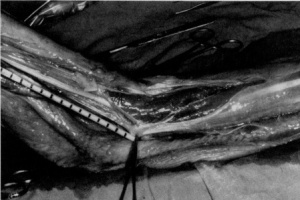 Struthers' ligament and associated median nerve variations in a cadaveric specimen. S. F. Gunther, D. DiPasquale, and R. Martin. Yale J Biol Med. 1993 May-Jun; 66(3): 203–208. Supracondylar process syndrome: case report and literature review.